Hello Spring! 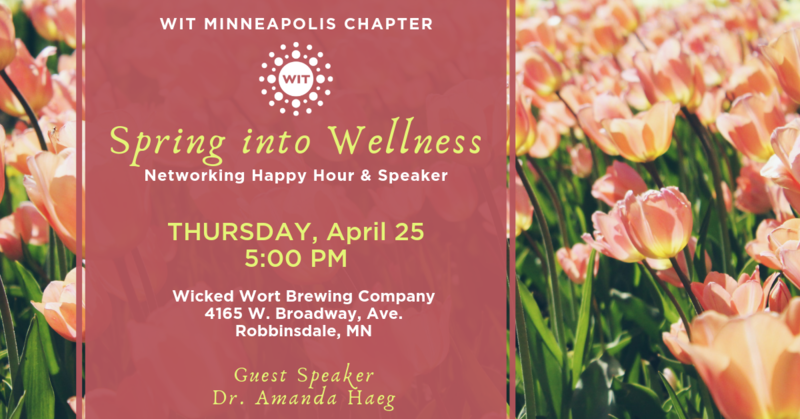 It's the time of year to renew and refresh, and WIT Minneapolis Chapter is excited to welcome guest speaker, Dr. Amanda Haeg, who will share holistic self-care tips and techniques to de-stress and heal from the inside out. We'll enjoy a networking Happy Hour after, along with 10% off any boutique purchase from Wickedly Charming Boutique. Ticket price includes a complimentary beverage of your choice. Food is pay-your-own-way. WIT Members: Please LOGIN for member pricing.